It's big. And a big winner! Travel across Hartford County with the confidence afforded by the 2019 Volkswagen Atlas, for sale at our Volkswagen dealer near South Windsor, CT. With powerful performance tech and advanced safety features, the 2019 Volkswagen Atlas has everything you've ever wanted in a VW SUV. And when you get the keys to a 2019 Volkswagen Atlas with 4MOTION® technology, breakthrough four-wheel drive capabilities will have you taking on the road with complete confidence. Want an upgraded powertrain? Opt for the 2019 VW Atlas V6 SE. 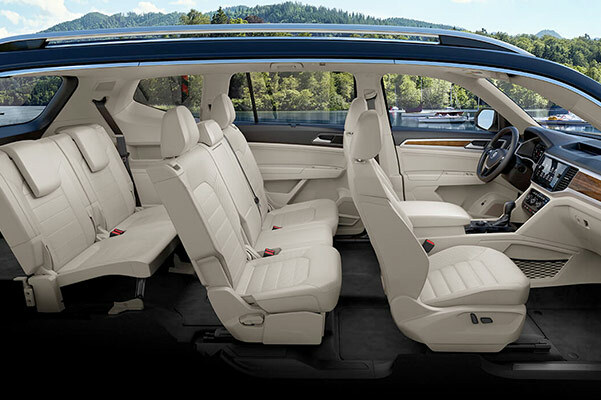 Climb into the 2019 VW Atlas interior and take a test-drive at Langan Volkswagen of Vernon. Save big on a 2019 Volkswagen Atlas lease when you ask about our competitive VW specials. Want to learn more about the 2019 Volkswagen Atlas changes? Go over the full list of 2019 VW Atlas specs with one of the experts at our Vernon VW dealer, then ask about 2019 Volkswagen Atlas lease and finance specials that may be available to you.